When the city is struck by a trio of unexpected deaths and suspicion falls on her sister and her father, Charlotte is desperate to find the true culprits and clear the family name. She ll have help from friends new and old a kind-hearted widow, a police inspector, and a man who has long loved her. But in the end, it will be up to Charlotte, under the assumed name Sherlock Holmes, to challenge society's expectations and match wits against an unseen mastermind. USA Today bestseller Sherry Thomas is one of the most acclaimed historical romance authors writing today, winning the RITA Award two years running and appearing on innumerable "Best of the Year" lists, including those of Publishers Weekly, Kirkus Reviews, Library Journal, Dear Author, and All About Romance. Her novels include My Beautiful Enemy and The Luckiest Lady in London. 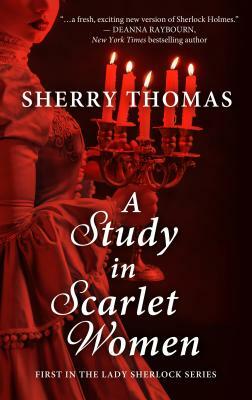 A Study in Scarlet Women is the first in the Lady Sherlock Series.